We bring you last week's top performances from Colombians who are playing abroad and who all have had prior experience of national team duties at youth or senior level. #1. 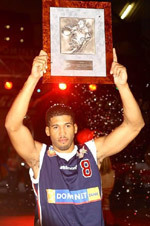 This week's number one is an experienced international power forward Juan Palacios (206-85, currently plays in France). He led Chalon/Saor to a 3-point victory against the 16th-ranked Le Portel (2-6) 85-82 in the French ProA in Monday night's game. Palacios scored 11 points, grabbed 6 rebounds and dished 3 assists in 22 minutes on the court. ES Chalon-Sur-Saone (6-2) is placed second in the ProA. But this is still an early stage of the season and everything may happen. It's Palacios' first year with the team. He has relatively good stats this season: 11.6ppg, 6.1rpg, 2.0apg, 1.3spg, 2FGP: 47.2%, 3FGP: 21.1% and FT: 90.5%(19-21) in seven games he played so far. Palacios has a dual citizenship: Colombian and Spanish. Former Guerreros de Bogota starter played for the Colombian senior national team one years ago. #2. Second place goes to an international guard Michaell Jackson (190-87, currently plays in Mexico). He led Aaguacateros to a victory over the sixth-ranked Abejas (3-5) 82-67 in the Mexican LNBP (second division) last Saturday. Jackson was MVP of the game. He scored 28 points (!!!) and had 4 steals. Aaguacateros Michoacan (7-1) is placed first in South group. It was his team's fourth consecutive victory in a row. But the season just started, so everything may happen. It's Jackson's first year with the team. Jackson has individually a very good season with high stats. He averages: 15.4ppg, 4.3rpg, 1.5spg, 2FGP: 55.6%(35-63), 3FGP: 36.0% and FT: 78.8%. Ex-Aguilas de Tunja player is in the roster of the Colombian senior national team. #3. The Colombian player who performed third best last week abroad was an international forward Hanner Mosquera-Perea (206-93, college: E.Tenn.St., currently plays in Poland). 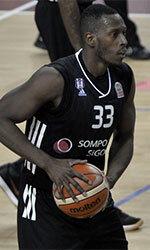 Mosquera-Perea could not help Rosa (1-4) to beat Twarde Pierniki (5-0). He scored 7 points in 17 minutes. Rosa was crushed 92-56 on the road by the leading Twarde Pierniki. But the season is still in it's first stage and everything can happen. This year Mosquera-Perea's overall stats are: 5.2ppg, 5.0rpg, 1.6spg and FT: 46.2% in five games. He is also a member of the Colombian senior national team. #4. Power forward Jhan Paul Mejia (208-94, college: Charleston, currently plays in Spain) was not able to help Quintanar (4-3) in their last game on Sunday. Despite Mejia's good performance the sixth-placed Quintanar (4-3) was defeated 75-67 in Guadalajara by the higher-ranked CB Guadalajara (#4) in the Group B. He recorded a double-double by scoring 13 points and getting the same number of rebounds. But there are still lots of games to play and it's a long way to go. Mejia's total stats this season are: 10.0ppg, 5.0rpg and 1.2apg. He is another player who holds two passports: Colombian and Spanish. Mejia is also Colombian national team player. #5. International point guard Hansel Atencia (178-97, currently plays in NAIA) contributed to a The Master's College, CA's victory against the Louisiana State University-Shreveport 86-76 in the NAIA on Friday night. He recorded 18 points and added 7 assists. The The Master's College, CA has a very solid 14-1 record this season. This year Atencia has very high stats. He averages: 18.0ppg, 3.5rpg and 5.0apg. Atencia has both Spanish and Colombian nationalities. He plays currently for the Colombian national team. #1. Experienced Luis Julio (201-C-80, currently plays in Chile) contributed to Aleman's victory against the fourth-ranked AB Ancud (5-4) 80-76 in the Chilean Liga Nacional last Monday. He recorded 6 points and grabbed 7 rebounds in 15 minutes. CD Aleman Puerto Varas Concepcion (4-5) is placed fifth in Conferencia Sur. Julio has individually a very good year with high stats. He averages: 17.0ppg, 7.9rpg, 1.9apg and 1.1spg in eight games he played so far. Julio has a dual citizenship: Colombian and Venezuelan.